By 1914 Europeans ruled 84% of the globe. How did they do it? Eleven hundred years ago Europe was a backwater. There were no grand cities, apart from Muslim Cordoba in Spain, and the remnants of Rome and Athens. The Middle East, India, and China were further ahead. It was the Arabs who kept alive the teachings of the Ancient Greeks’ knowledge of science, medicine, architecture, and philosophy. We now have two schools of thought. Two years ago came Professor Philip Hoffman of Caltech University with his book Why Did Europe Conquer the World? He argued that Europe’s pace of innovation was driven by a peculiar form of military competition that he called a “tournament”—the sort of competition that under the right conditions can drive contestants to exert enormous efforts in the hope of earning a prize. Europe, unlike the Ottoman Empire and China, was a very un-unified kind of place. Since the fall of Charlemagne in 814 there was no one strong enough to hold Europe together. Dozens of small states and principalities, often vying to be top dog, were stimulated to nurse their competitive instincts, and in doing so and fighting they refined their military capabilities more than that of any of the other world’s peoples. European rulers raised taxes and lavished resources on armies, navies, and gunpowder technology. Moreover, unlike in Asia, private entrepreneurs faced few legal, financial or political obstacles to launching expeditions of conquest and exploration. This is why the British East India Company could conquer much of India. In contrast, China was a massive hegemon; Japan and the Ottoman empires sizeable ones; India partly one. A hegemon inevitably comes to believe that since it’s politically dominant it doesn’t have to work so hard at maintaining superior arms. So when it came to gunpowder technology and its adaptation to warships, the European powers, each seeking to outscore the other, could often call the shots against Asia’s hegemons. 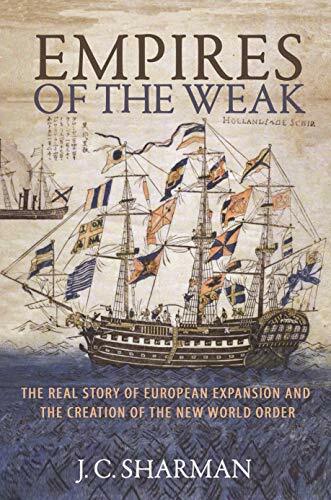 Now comes along a book with a different take on all this: Empires of the Weak by J. C. Sharman, professor of International Relations at Cambridge University. He doesn’t appear to have read Hoffman’s book, but it reads as if he was refuting it. In Latin America the Conquistadores, who did set out to conquer, won because of alliances with smallish local kingdoms and the spreading of European diseases. They did not win because of superior military technology. Pizzaro, who conquered the Incas had an army of only 170. Pizzaro did indeed have guns which the Incas didn’t, but they were just a few canons and basic muskets. Fighting was mainly hand to hand. In Africa, the imperialists limited themselves to border posts where they bought slaves from local chiefs. Incursions into the interior when they happened later were pioneered with small groups of soldiers, also fighting hand to hand. Sharman argues that, apart from the Americas, Europeans did not gain military superiority during the period of European expansion from the 15th century to the late 18th century. He posits that European success in this era is explained by deference, and even subordination, to strong Asian and African politics, the import of deadly European diseases in the Americas, and maritime superiority earned by default because these local land-orientated polities were largely indifferent to war and trade at sea. A Chinese admiral once led a look-and-see trip to Africa but then ignored it.